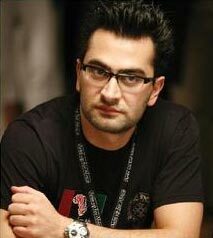 Antonio Esfandiari (changed his name from Amir Esfandiari) was born in Tehran, Iran on December 8, 1978. At the age of 9, his family relocated to the US and lived in San Jose, California. He changed his name to Antonio when he turned 19 due to the influence of living in a Mexican American community. During that time is when he became a professional magician, which is where, in part, he gets his nickname from, “the Magician”. The other reason for his nickname is due to the fact that he enjoys playing with his chips while playing poker; he does fancy tricks with them while playing. He got into poker when he was invited to play Texas Hold’em. Poker must run in the family since his little brother, Pasha, also plays poker. Antonio Esfandiari started out his career as a professional poker player later in life, after trying his luck at being a magician. It wasn’t until after he had been playing poker for a while that his fame and fortune finally arrived. He had a very good year in 2004. He managed to win a bracelet at the 2004 World Series of Poker, Pot Limit Hold'em event, where he won $184,860. He also participated in the 2004 World Poker Tour, L.A. Poker Classic, where he won his first title and made $1,399,135. He won his second title at the World Poker Tour in 2010, at the Doyle Brunson Five Diamond World Poker Classic, winning $870,124. In between winning his two WPT titles, he participated in the European Poker Tour. In the 2008 EPT Grand Final in Monte Carlo he managed to get to the final table, placing eighth and winning €168,000 ($266,004). He also managed to finish in 24th place at the 2009 WSOP Main Event, even though he was knocked out on day 8 of the tournament, he still won $352,832. He hasn’t been playing poker for that long, but has had a lot of success in the short time he has. He is a flashy player, as well as a flashy person. This helps him out a lot since he has his own TV show called I Bet You, where he co-stars with his friend Phil Laak. The show consists of them travelling around the US and betting on anything and everything that can be bet on; a must see for those that enjoy an entertaining twist to gambling. Esfandiari is known for his party boy and carefree attitude. He has been known to party a lot, and he even took shots with a fellow poker player, Andrew Robi, before they played heads-up for a WPT title. Going along with his stardom, he has appeared in different TV shows such as Poker After Dark, High Stakes Poker, and Poker Superstars Invitational Tournament. He has made a cameo appearance on the hit HBO show Entourage, in season 7. With his rise to fame and fortune, he was taken notice of by Victory Poker, where they scouted him and made him part of their team; he currently still plays for and at Victory Poker. He has also been made into the face of World Poker Tour's Poker-Made Millionaire. Any controversy that surrounds him is not because of some financial debacle; it is more due to his recklessness. He won his only bracelet to date at the 2004 WSOP, but he has also made it to 4 final tables and had 14 money finishes while playing in the WSOP. His most recognized achievements were during his participation in the World Poker Tour. He won 2 titles, made it to 5 final tables, and had 9 money finishes. While playing in the EPT he has been to 1 final table and had 1 money finish. He has made total live tournament winnings of over $4,500,000 as of 2011. Keeping his playing style in check with his personal style has allowed him to gain this fame in the poker world. He is a delight to see in action as he keeps the fans and viewers entertained the entire time.